We decided to spend the day visiting the churches of the Lothingland peninsula, but it had taken less time than I'd thought it would. Some of the churches that we'd expected to find locked were open, but none of the ones that were locked had keyholders. The ones on the Suffolk side of the border were open, as you'd expect, but we were also pleased to find the Norfolk churches of Fritton and Bradwell open to strangers and pilgrims. The grim parish church at dismal Hopton was padlocked up to the eyeballs, and the graffiti-stricken Belton church appeared to have been completely abandoned, a ruin in the making. It was with some relief that we decided to head back south into gentle Suffolk - the alternative, leaving the peninsula via Yarmouth, was too awful a prospect to contemplate. Where to go next? I hadn't been to Barnby or North Cove for a number of years, and so I suggested that we take a look there. Both churches have no less than three keyholders each, but at each church not a single one of them answered the phone - perhaps they were all at a keyholders' conference or something. Inevitably then, my thoughts turned to Barsham, a bit further down the road on the other side of Beccles. Barnby and North Cove straddle the A146, a rat-run between Bungay and the sea. It is not a road a cyclist should spend any amount of time on. But the Church of the Most Holy Trinity is gorgeous in its setting across a meadow from the road. Once in its pretty churchyard, the sound of the traffic is left behind. The splendid former rectory slumbers just beyond the fence. This was one of Suffolk's great Anglo-catholic shrines, and generations of visitors have made the same journey as we were making. And even before that extraordinary movement reared its head, this parish touched the world in a significant way, at least once. The exterior of this building is the most beautiful of any small church in Suffolk. I dare say that the setting was even more idyllic before the elm trees which Arthur Mee saw here in the 1930s were lost to Dutch Elm disease. The most striking feature is at the east end. Here, like an extension of the window, an extraordinary flint lattice spreads across the face of the wall. It has been variously dated as anything between the early 12th century and the late 19th century; Clive Hart, in his excellent book East Anglian Flushwork, dates it as 16th Century. It is most unusual; there's nothing exactly like it anywhere else in Suffolk, although something rather similar has been picked out in brick on the east wall at Spexhall. Near the south porch sits a memorial to one of the famous names associated with Barsham. Adrian Bell was the finest author to write books about Suffolk in the 20th century, particularly Corduroy and Silver Ley. He was the father of the white-suited former Independent MP, Martin Bell. Curiously,the tower and nave are not fully joined above head height. There is a window in the west wall of the nave, suggesting that the body of the church here is older than the tower against which it stands - or, more precisely, the west wall is. The Caen stone of the south doorway suggests a post-1066 date for that feature, at least. You step down into a charming, devotional space. The chapel to St Catherine on the north side creates an unusual dynamic, the chancel pressed as it is against the south wall. As elsewhere in Suffolk, much work was done here from the 1870s onwards. The restoring architect was Charles Kempe, best known these days for the glass he produced in vast volume. Kempe had a number of assistants during his long career, two of whom would have a part to play in the story of this church. One was Frederick Eden, who would return here at the start of the new century and furnish this understated, devotional shrine. His loving and meticulous attention to detail is ultimately what, internally at least, makes Holy Trinity the church it is today. He was responsible for the rebuilding and furnishing of the chapel of St Catherine in 1908. He found a Norman font bowl under the chapel floorboards, which is now on display there. Also his are the communion rails, the sanctuary carpet, the aumbry, the war memorial and even the lychgate outside. Most important of all, however, is the glass, which is almost all his. The other Kempe apprentice was the young Ninian Comper, that flamboyant Anglo-catholic, whose finest hour, in East Anglia at least, would come up the road at Lound. The church guide quotes a letter which the nineteen year old Comper wrote to his mother from Barsham rectory on Good Friday 1883: Dearest Mother mine, it is a lovely place - a sweet rectory in the midst of splendid trees & the little church almost touching the house. There is a curious East window all in diamond tracery down to the cill and most of the diamonds contain a Saint or Angel painted by my master so I feel at home. And there is a pretty Elizabethan screen, done up & supplied with a rood and iron gates by my master also. Mr Williams is what I call a regular thorough priest and not a rector or a clergyman and is much to my mind but Father knows him well, I believe, and so need not try to dwell upon his virtues! The rood screen is very unusual - again, there's nothing quite like it anywhere else in Suffolk. It is probably Laudian, as at Kedington, having been put up in the 1630s to replace that torn down at the Reformation a century before.The rood, which is not the one Comper saw, and the arch of honour were put up in the 1890s, and painted in 1919. I can't help thinking that the archway has a DIY feel to it, but the little statues are rather sweet. Another unusual feature of the church is the restored low side window in the chancel. The shutter and its hinges were made by a local blacksmith, probably under the supervision of Kempe. The window above shows Jesus healing the ten lepers, a reference to the then-current misguided belief that low side windows had something to do with allowing lepers a view of the altar. This idea has now been entirely discredited, but still the window remains, a memory of the enthusiasm for the medieval in the last years of the 19th century. A roughly surviving St Christopher wall painting is discernible on the north wall of the nave. These are relatively common in this part of East Anglia, and you probably wouldn't notice this one unless you looked for it. The length of the wall is now taken up with the famious England Expects That Every Man Will Do His Duty signal in flags. There's a good reason for this, as we will see. The George III coat of arms comes from nearby Shipmeadow, now a private house, as do the paschal candlestick and the Jacobean Holy Table in the rebuilt chapel of St Catherine. A simpler memory of the past is the memorial board to Harry Stebbings, gassed in the First World War, which was painted by Arthur Batchelor of Norwich at cost of materials only, according to the Rector of the time. More elaborate is the important terracotta table tomb, one of seven in East Anglia, built from parts manufactured in and shipped from Flanders in the 1520s. It was probably to Sir Edward Etchingham, and it served as an Easter sepulchre. There are also a number of floor brasses and ledger stones. The 'rectors and patrons' board was salvaged from a Catholic church in Norwich, presumably the Jesuit chapel in Willow Lane. On the 8th of February 1906, lightning struck the east end of the church, destroying the stonework of the east window and smashing the medieval mensa which had been reinstalled on the high altar. The fund raised to repair this damage also paid for the building of the north aisle as the chapel of St Catherine. In 1979, a fire destroyed the nave roof, and scorch marks caused by fallen clumps of smouldering straw can still be seen on several benches. 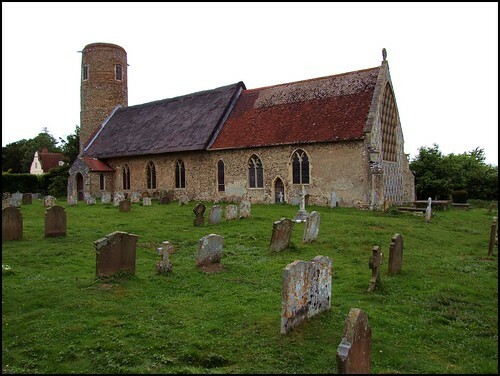 There are a number of Suffolk churches where a dynasty of vicars has handed the living down through the generations. Most famous, perhaps, are the Wallers at Waldringfield, where present rector John Waller is fourth in an unbroken line stretching back to the 1850s. But here at Barsham, the situation is illustrated in extremis. The Suckling family held the living here from the 17th century right up until the parish was merged into a benefice in the late 20th century. They were the local landed family, and in a position to present themselves to the living on each occasion. This was not unusual, up until the mid-19th century, but the Sucklings carried the tradition beyond that. This was partly by tenaciously bequeathing the property, presentation rights and living to distant cousins when the male line died out, on the condition that the recipient changed his name to Suckling before inheriting. Marriage to a Suckling daughter was another way of qualifying. But the other thing that ensured this remarkable dynasty's survival was the way they embraced Anglo-catholicism so wholeheartedly, at a time when a career in the Church was increasingly seen as a poor alternative to the fortunes to be made out in the British Empire. They tapped into the energy of the movement in the East End of London, where they also presented livings. They were particularly associated with the extreme High Church social action movement of the late 19th century, being good friends of Father McKonochie, one of a number of Anglican priests shamefully prosecuted by the Church of England and imprisoned for 'popish practices'. McKonchie retired, a broken man, to Barsham Rectory, before his life ended tragically some five years later. He is remembered by a memorial at the west end of the north aisle here. The Sucklings were also associated with the nearby Anglican convent of All Hallows, at Ditchingham in Norfolk, an institution that scandalised upright Victorian protestants. As at Claydon, the parish priest here suffered vile abuse for his connection with it. For a few people, this church is a place of pilgrimage for reasons unconnected with its colourful liturgical history. In the 18th century, one of the Suckling daughters grew up to be mother of Admiral Horatio Nelson. In the days when a patriotic pride was taken in the waging of war and advance of imperial adventure, Nelson was considered a great British hero.